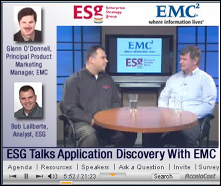 Glenn is interviewed by Bob Laliberte, analyst at Enterprise Strategy Group about EMC's Application Discovery Manager (ADM) product. Produced by Accela Communications, this video gives good insight into the ADM product and EMC's plans to build upon it. You are required to register to view this video, but it's only the usual business contact information requested by such things. This video was recorded in September, 2007. In early 2005, RealTime Publishers published an eBook by Don Jones entitled The Shortcut Guide(TM) to Network Compliance and Security. It was sponsored by Alterpoint and Glenn wrote the forward to the book.